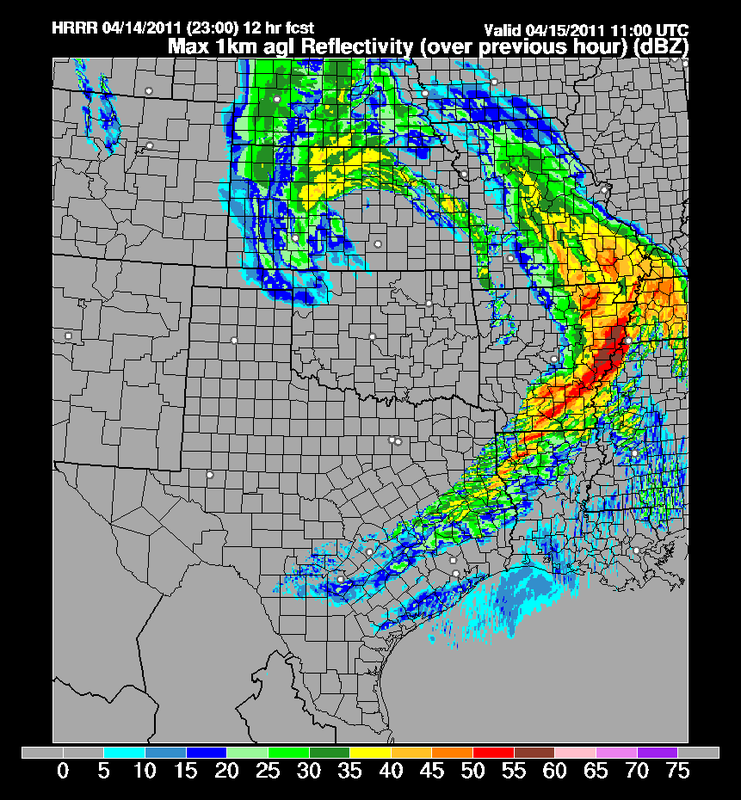 I've been checking out the high-res computer models that now have the morning round of severe weather in their sights. 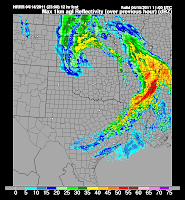 Ongoing supercell storms over eastern OK will be moving into western AR in the next couple of hours and are handled well by the high-res models, particularly the HRRR. I expect a Tornado Watch to be issued for much of western and central AR shortly. The models are showing a new area of showers and thunderstorms to develop along the warm front (which I mentioned in my original afternoon post below) and move rapidly into the Memphis area after midnight - likely in the 2-3am time frame (image to the left is forecast radar valid at 3am - click here for the entire overnight loop). While a few of these cells could contain some hail or a brief wind gust, I don't expect widespread severe weather with them. 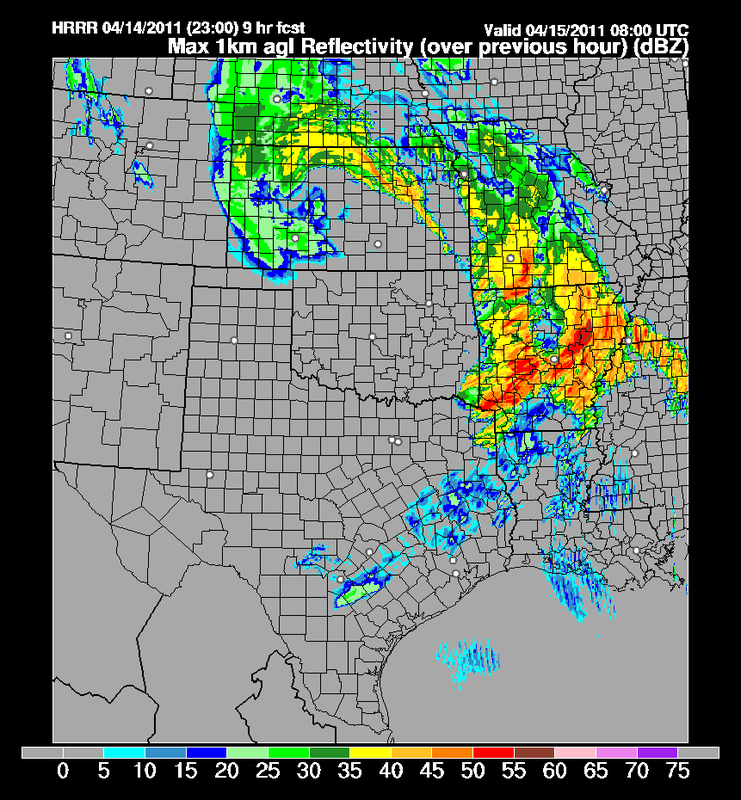 As the precip associated with the warm front continues lifting northeast, the storms moving across AR will likely make it into the area just before sunrise, or between 5-7am, lasting a few hours (image to the left is HRRR forecast radar at 6am). These storms will have a higher risk of being severe as they will be moving through the warm sector behind the warm front and could come in the form of a squall line. Look for the possibility of large hail, high wind, and maybe an isolated tornado which will impact the morning rush hour. In addition, very heavy rain will be likely. I then expect somewhat of a break (scattered thunderstorms still possible) before another line moves through in the afternoon hours along the cold front. My thoughts on that have not changed from what I indicated below. Please see the end of the post below for information on our coverage of these storms and how you can stay "weather aware." Live coverage from MWN is expected to begin ahead of the line of storms coming across AR due to arrive around sunrise. "MWN - Straight-talk weather, without the fluff!" Yesterday, I posted about the chances of severe weather for late tonight and again during the day Friday. My thinking has changed little with regards to the timing of the storms. In that post, I showed a couple of graphics indicating that the GFS computer model was running several hours faster than the NAM model, bringing the cold front through during the afternoon while the NAM was showing an evening passage. They have converged a little closer on a solution, but the preferred GFS (in this case) still maintains frontal passage about 3-4pm. Also, as correctly predicted in yesterday's post, the Storm Prediction Center has upgraded areas just east of Memphis to a Moderate Risk of severe storms. Right now, the metro area is under a Slight Risk for late tonight through the day Friday. Hatched area has the greatest risk of significant severe weather. Here's how I expect things to unfold tomorrow: A warm front will surge north overnight and reach the Memphis area in the early morning hours Friday, or around sunrise. Showers and a few storms will be possible ahead of and along the front. Behind the front, the first wave of strong storms will arrive. I'm thinking that they will be in the area between 5-10am and could cause problems for the morning commute. These storms will bring heavy rain and lightning, and could contain hail and damaging wind and the threat of a tornado. From late morning through early afternoon, scattered showers and thunderstorms are possible, but I'm guessing they won't be very organized or widespread. Some areas could even see some sunshine, which could aid in the destabilization for the afternoon round of storms (that's not a good thing). Then, probably between 1-5pm, I expect another pretty good chance of severe thunderstorms. The biggest threat with these storms, which will likely be supercellular, will be large hail. In fact, as freezing levels lower and wind shear is sufficient, some hail could be very large (golf ball or larger). Some storms could also produce damaging wind and an isolated tornado. All severe activity should move east of the metro area by around the evening rush hour, though areas near the TN River into northeast MS could deal with severe weather, including tornados, through the evening hours. MWN will have complete coverage of the storms tomorrow (as long as the power stays on!) through our various channels. MemphisWeather.net on the web will have all of the radar, satellite, watches, and warnings information you need. Facebook and Twitter will be used to update the situation as it unfolds. Sign up to receive severe weather alerts via e-mail or on Twitter (@shelbyalerts) and have your NOAA Weather Radio ready when severe weather watches and warnings are issued.